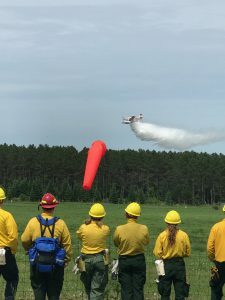 Thursday, students at the Minnesota Wildfire Academy performed field exercises giving them the opportunity to apply their classroom knowledge, perform the roles and responsibilities for their specific tasks, and model the procedures that had been demonstrated earlier in the week. Students in the Portable Pumps course practiced hose and pump operations. They set up portable water units, problem-solved when things went amiss, and then correctly shut down the water delivery systems. 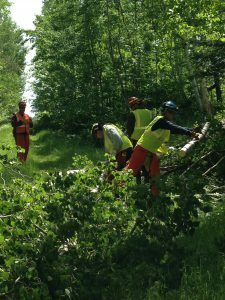 In the Chainsaws (Faller) course, firefighters were introduced to the maintenance and use of powered chain saws. Their field exercise provided entry level training in surroundings similar to fireline situations. In wooded areas, students demonstrated safety first and then performed correct chainsaw use to fall trees in a designated direction. Students in the Chainsaw (Faller) course. Students use chain saws to drop trees to a specified position. 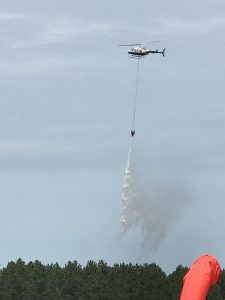 Students in the Basic Firefighters course observed an initial attack air drill which required the use of a fixed-wing air attack plane to monitor and control the mock fire perimeter, one helicopter and two Fire Bosses. The Fire Bosses and helicopter were used to scoop and dump water on the fire. A Fire Boss drops water during a mock initial attack exercise at the 2018 Wildfire Academy. Safety is always the first priority. All students are required to wear personal protective equipment (PPE) specific to the task to be completed. Some types of PPE include hard hats, goggles, ear protection, Nomex (fire-proof) shirts and pants, safety vests and two forms of tick protection. Even with the large amount of activity and number of students and personnel involved, there has not been a safety incident reported this week. 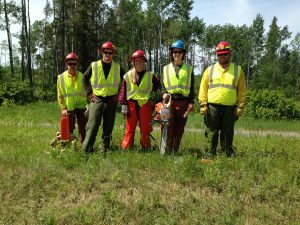 The Minnesota Wildfire Academy is in its 18th year. On Thursday, June 7, there were 463 students attending 19 courses. Thirty-two courses have been offered throughout the week for nearly 700 students. An incident managementc team is managing the academy with 54 personnel.